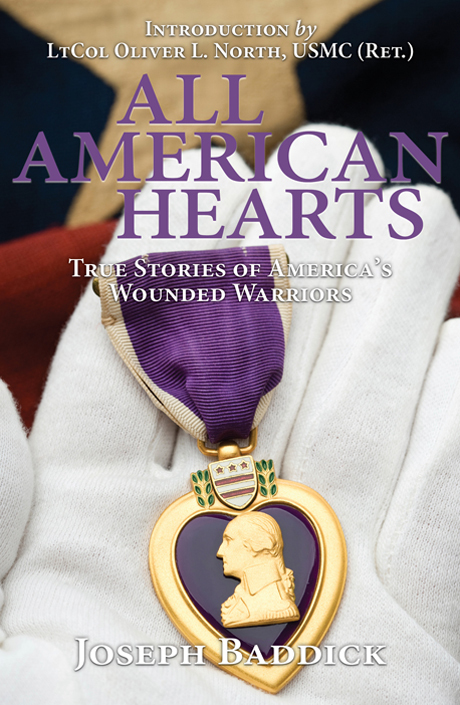 All American Hearts, a collection of true stories of Purple Heart recipients, is Joseph Baddick’s second book. His first, My Hero My Son, chronicles the brief life and devastating loss of his son, Andrew J. Baddick, who died in Iraq in September of 2003. Responding to hundreds of emails, letters and phone calls after releasing My Hero My son, Joe realized that many of those reaching out and consoling him in his hour of need had suffered greatly themselves. They were wounded warriors-young soldiers who had been injured in Iraq and Afghanistan. Those courageous young men and women had lost so much, yet their spirits remained unbroken, and their will to move forward in the face of great adversity inspired. All American Hearts was born of their courage. Told in their own words, their brutal honesty will astound, their courage will inspire, and the graphic descriptions of their injuries will shock. This important piece of military history shines a great light on the power of the human spirit to love and protect, and the power of the human being to destroy. Joseph Baddick served as an 82nd Airborne Division paratrooper before working for the Pennsylvania Department of Corrections for twenty years. Originally from the coal region, he now resides with his wife Sheila in Berks County, PA. When Joe is not working for the Miller-Keystone Blood Center, he enjoys golf, winemaking, fine dining, traveling, the outdoors, and spending time with his grandchildren. His first book, My Hero My Son, tells the story of his son A.J., an 82nd Airbone Division paratrooper who died in Iraq.